One of the challenges when working on this species is the inaccessibility of some populations that occur on steep cliffs. To overcome this challenge, we collaborated with Working for Water and the eThekwini Municipality for assistance from existing high altitude (HAT) and the Working on Fire teams with clearing populations that are inaccessible to Invasive Species Programme clearing teams. 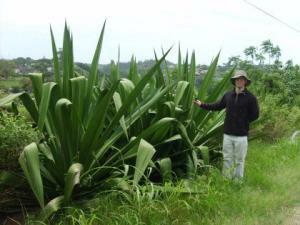 Furcraea foetida is originally from South America and the Caribbean. It has been widely cultivated for fibre in the past. This species was brought to our attention in 2009, with only a few known localities in KwaZulu-Natal. F. foetida produces a massive amount of bulbs and can survive a wide range of environmental conditions, including growth in shallow, infertile soil, on steep cliff-like habitats and rocky edges. The Invasive Species Programme team has been making awareness-raising efforts and successful collaborations with stakeholders and partner institutions, as well as detailed monitoring surveys of ‘hotspot areas’ that have significantly increased the number of known localities. In 2012, a clearing team was appointed to clear the population in KwaZulu-Natal. 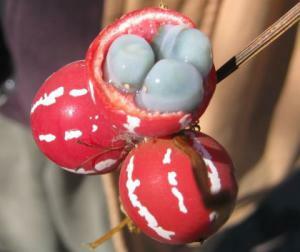 This species is more commonly known as the Lollipop climber and is one of the target species known to occur within eThekwini. It is a slender climber from the Cucurbitaceae family that is native to Australia, Malaysia, Papua New Guinea and Tropical Africa. It is listed as a Category 1a under South African legislation, which means it requires compulsory control. The Invasive Species Programme has worked together with stakeholders (eThekwini Municipality and various conservancies) to raise awareness about this species in order to detect populations as accurate distribution data are vital to inform management decisions. Thus far we are aware of localities in Pinetown, Kloof and Pietermaritzburg, and many of these plants have been destroyed by our partners and private landowners. However, it is very likely that more populations exist hence we would appreciate people looking out for this species and reporting localities to us. C. madagascariensis is native to North-western Madagascar. 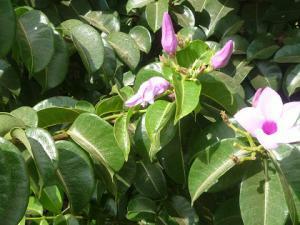 It is considered highly invasive in Hawaii, Australia and Brazil. This species is listed as Category 1a under South African legislation, meaning it requires compulsory control.This plant is especially dangerous as the milky sap that oozes from the stems and leaves is extremely toxic to all livestock, causing burning rashes and blisters. Powdery dust from dry plants can cause vicious coughing, swelling of the nose and sore blistering of the eyelids to humans. C. madagascariensis is extremely poisonous if ingested as it contains cardiac glycosides that have negative impacts in heart functioning in humans and animals. This species was first spotted in the Limpopo region in May 2012 and has since been detected in Ga-Matipane, Mokwakwaila, Makgato, Taaibos villages as well as Duiwelskloof. Herbarium specimens have been collected and pamphlets and dossiers have been compiled for distribution. Awareness raising campaigns were held targeting the surrounding communities and various stakeholders. Monitoring of the infected areas will be monitored regularly where they will be mapped and the population sizes estimated. 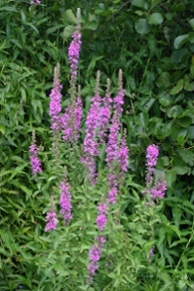 Purple loosestrife is an aggressive, competitive wetland perennial from Eurasia that has invaded vast areas of the northern US and Canada, forming dense stands. The plant produces beautiful spikes of purple flowers (and an abundance of seeds) in summer and is most visible at this time.The appearance of purple loosestrife on the Liesbeek River in the Western Cape was noticed by Liz Wheeler of Friends of the Liesbeek, about 2 years ago. The Friends have tried to control the plant since, but it is proving difficult to remove as it grows amongst other riparian plants and is well rooted. The Invasive Species Programme, together with Friends of the Liesbeek and the City of Cape Town and SANParks, are currently developing an intensive control plan (focusing on physical removal) for Lythrum sp. on the Liesbeek River, as the population may be small and localised enough to attempt complete eradication. It is estimated that controlling this plant across 19 American states would cost about US$ 45 million per year (2002 estimate). Lythrum salicaria and Melaleuca quinquenervia have been designated as 2 of the top 100 worst invasive species globally (ISSG, 2000). This species is originally from western and central Europe. This species was introduced as a garden ornamental, hedge plant and to stabilise highway embankments, but has become a serious invasive plant in New Zealand, Australia, North America and Chile. It thrives in disturbed habitats. 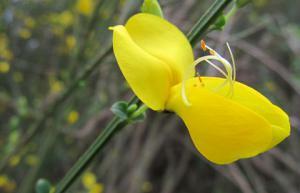 In South Africa, this plant is a proposed Category 1a under South African legislation, which means this plant is prohibited and needs to be eradicated. Populations have been discovered in KwaZulu-Natal and the Eastern Cape. Germany and Europe, respectively. Vespula germanica (yellow jacket) and Polistes dominula (European paper wasp), have become naturalised in the south western part of the Western Cape. The German wasp is known internationally to have caused human deaths because of its aggressive nature and because they are attracted to food with meat protein in environments such as open-air restaurants. The European paper wasp is a recent settler (2008) but shows signs of aggressive invasiveness as it has already spread for approximately 50kms and is now common in the regions of Kuilsrivier and Stellenbosch.The Invasive Wasps Project is a research project with eradication, infestation control and communication components. The project is managed by a consortium of researchers from Stellenbosch University, SANBI, the Agricultural Research Council, CapeNature and Iziko Museums. The project will delimit the distribution of both wasps and investigate the feasibility of eradicating them from South Africa. Failing eradication, the project will investigate ways to manage them and prevent their spread to new areas. Invasion of Hydrilla verticillata in South Africa was first noted at Pongolapoort Dam in KZN in 2006. H. verticillata is an aquatic weed, mainly invading dams and other aquatic systems. It is believed that H. verticillata invasion has been facilitated by the aquarium trade in most countries, while the fishing industry is also playing a major role in its invasion in South Africa. H. verticillata originates from Asia. It is aggressive and has a high potential of invading other water bodies in the country. It belongs to the Hydrocharitaceae family, whose members often exhibit characters of invasiveness. It has four ways of reproduction, namely: seed, fragmentation, tubers and turions which gives it a competitive advantage over other aquatic plants, hence it is an aggressive invader and a habitat transformer. The Invasive Species Programme has introduced long term monitoring of Hydrilla invasion at Pongolapoort Dam. This involves integration of other stakeholders such as Working for Water (WfW) and ARC-PPRI. 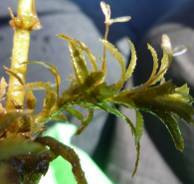 The Invasive Species Programme is taking a lead in conducting surveys, while the ARC is looking at biological control, and WfW is responsible for the containment and prevention of Hydrilla spreading. The aim of conducting the surveys is to determine species composition; growth conditions, species abundance and verify areas invaded by Hydrilla.